I love to blog design tips. It’s fun for me learning leading trends on home design and decor and passing it on to you. But this is the time of year many of you might be thinking of listing your home so I decided to do a blog series on the best most effective things you can do as a homeowner that won’t break the bank. And whether you are listing your home or not….take a look. You just might want to read on!!! Just because it’s a sellers market, don’t get complacent and think you don’t need to do anything but put a sign in your yard and buyers will just flock to your home. Now I have listed homes like that but usually there is some room for improvement. With a little effort and your own sweat equity you can literally put thousands of dollars in your pocket! Wouldn’t that be nice. This week I’m starting a Series on Selling Secrets. This yard is very typical of many neighborhoods in Southern California with the drought we have all suffered. No matter how good the interior of your home looks, buyers have already judged your home before they walk through the door. You never have a second chance to make a first impression. It’s important to make people feel warm, welcome and safe as they approach the house. Spruce up your home’s exterior with inexpensive shrubs and brightly colored flowers. You can typically get a 100-percent return on the money you put into your home’s curb appeal. If your grass is dead, hire a landscaper to either seed or sod or you can do it yourself. Make sure you know what you’re doing and do your homework first on proper seeding and sod application. Remember my last blog post on the benefits of painting your front door! Doors painted shades of navy blue to dark gray or charcoal earn a premium of $1,514 … 3 hours of work and a quart of paint. If it’s wood and you don’t want to paint it, clean it up with a quick sanding and re stain to give it a fresh look. 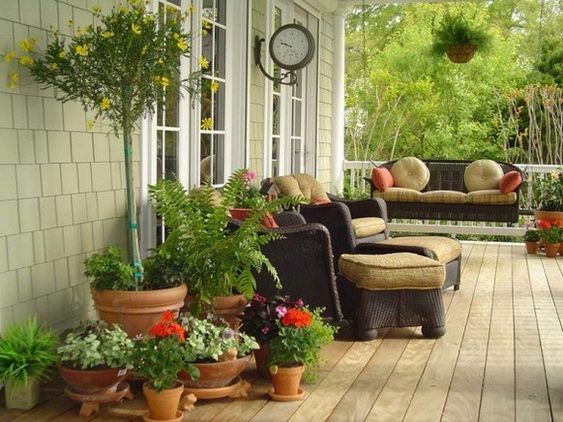 #3 Adding layers of plants will give more dimension to your porch. Just freshen them up. Make sure the pillows are clean free of all leaves and dirt. Your buyers may just want to sit down to take in the view! Garage doors aren’t something that typically will turn off buyers unless they’re the old worn wood style or dented existing metal door. If you do need to replace it but want a quick update, think of windows. Depending on the style of your home, hardware can be a real inexpensive way to add curb appeal. 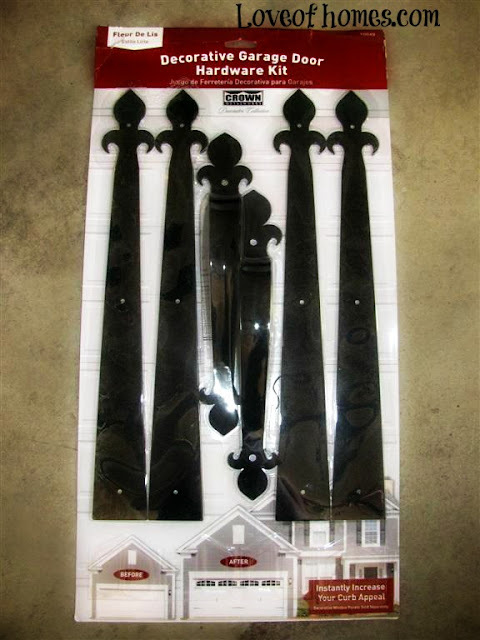 I found this hardware set for garage doors. 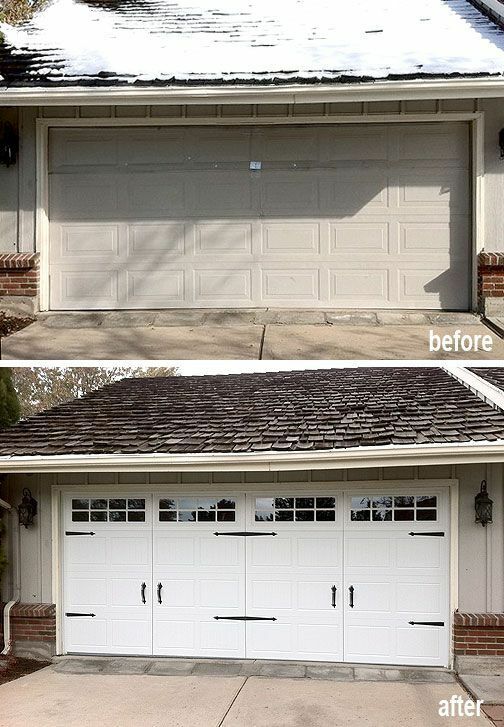 If you think your door is fine and you don’t want to spend $$ updating your garage door…At least POWER WASH IT!!!!! This is a no brainer. During the winter months weeds really grow. An hour of prevention with Round Up can make the difference and make a yard look really manicured. Torn screens will be called out on an inspection and buyers will notice them. Get a repair kit and go for it. It will take an afternoon but really well worth it. #7 Did I mention Power Wash? Welcome those viewing your home with a nice new mat. Most mats have been there for awhile so buy a new one and make a great first impression. Here’s another tip…if you have floors you want to stay fresh during the duration of your listing, provide booties in a nice basket. Buyers will not mind taking a moment to put them on. Now the outside is done, ready to go inside? Next blog…The kitchen comes first!